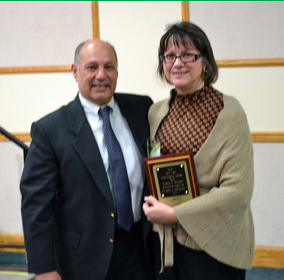 Executive Director of the Area Agency on Aging District 7 (AAA7), Pamela Matura, was recently surprised and humbled when she was awarded with a special Lifetime Achievement Award from the Ohio Association of Gerontology and Education (OAGE) at their recent conference at Ashland University in Ashland, Ohio. OAGE is an association of educators, researchers, professionals, and students in Ohio dedicated to gerontological education, research and practice. The organization promotes gerontological education, supports Ohio’s aging network as a resource for research and practice, and provides professional development for students, faculty and professionals in the field of aging. OAGE’s Lifetime Achievement Award, which according to OAGE President Bob Applebaum, Ph.D., is not presented very often, is given to those special individuals who have exemplified excellent leadership through the aging network in Ohio over their career. During the announcement at the state conference, Dr. Applebaum referenced a number of characteristics that a candidate for the Lifetime Achievement Award should possess including leadership, mentorship, vision, effective administrative qualities, care, courage and humor. Dr. Applebaum states that Pam was an excellent choice for the award. Pam has been Executive Director of the Area Agency on Aging District 7 since 1989. Prior to, she was Superintendent for the Gallipolis Developmental Center (GDC) from 1985-1989. She earned her bachelor’s degree in Social Work from Rio Grande College and her master’s degree in Health Science from the University of Florida. In addition, she has a specialist certificate in Gerontology from the University of Florida, as well as a number of other certifications and licensures. Pam has 24 years of experience at the Area Agency on Aging and 15 years of experience specific to developmental disabilities. Pam credits the talented staff and individuals she has worked with over the years for the achievements and successes she has been able to share with them as a part of her leadership roles. Examples of some of her “favorite” leadership milestones include the establishment in the 1980s of a GDC regional diagnostic evaluation center for individuals with developmental disabilities, which was the first of its kind and is used by Ohio’s county probate judges; and the purchase of Smeltzer’s Greenhouse and Garden Center in Gallipolis in the 1980s, which was transformed into “Riverview Productions,” a program developed to provide work opportunities for GDC residents with developmental disabilities in order to sustain meaningful employment. During her years at AAA7, Pam recalls the implementation of the PASSPORT program in 1990, which allows older adults with a nursing home level of care to remain in their homes and receive services from a variety of community agencies with whom the AAA7 contracts. Currently, there are around 4,000 individuals being served through PASSPORT in the AAA7’s ten counties, making it one of the largest rural programs of its kind in the nation, with the program having helped create and/or expand the Agency’s 118 service providers in the AAA7’s 10-county district. Currently, the Agency has an overall budget of approximately $52 million with 140 direct-line staff at AAA7 offices in Adams County (West Union), Gallia County (Rio Grande), Pike County (Waverly) and Scioto County (Wheelersburg). Services, provided directly through the AAA7, or through contracted community providers include, but are not limited to: information, referral and assistance; personal care and homemaking; respite care; adult day care; assisted living; caregiver support; case management; home repair; transportation; home-delivered meals; community-center meal programs; and linkage to community services. In addition, Pam recalls the ten years the Agency expanded its mission with the Ryan White HIV/AIDS Case Management Program, which provided helpful assistance for individuals with HIV who needed to connect with important resources and services in the community. At the time, no other agency was doing this type of service, and the AAA7 agreed to assist until the capacity of other more appropriate agencies could be developed so that individuals in southern Ohio would not go without services or have to drive to urban areas for the services. Currently, Pam is proud of the work the Agency has achieved with the recently-launched federal Veteran’s Self-Directed Program. Through the program, AAA7 care managers help veterans of all ages who live with physical and psychological conditions connect with resources in the community in order to live safely and independently at home. One of only 26 like programs in the nation, after only one year of operation, the partnership the AAA7 has with the Ohio Regional VA Medical Center in Chillicothe is currently the largest rural program of its kind and the third largest in the nation. Pam, again, goes back to the notion that there is no “I” in “team” and that the successes she has been able to be a part of are really an extension of the hard work and dedication of the fabulous individuals she has had the opportunity to work with, lead, mentor and collaborate with. She was very honored to receive the award from OAGE and thankful for all the opportunities and relationships in her career that have helped her achieve a lifetime of experiences. Pam resides in Gallipolis with her husband, Ray, a sociology professor at the University of Rio Grande. She has two children, Meagan and Ryan; son-in-law, Chris Barnes; daughter-in-law, Stephanie Matura; and grandson, Nick.